quiet day with god’s creation | doberman pizza. after a morning devotional and brunch in Blackburn with some of our newfound friends (newfound after this summer’s outreach projects, that is), I called up my Dad to get a ride home to Cumberland village this afternoon, where Mom’s been cooking jars of preserves, pies and even a turkey! it’s nice to go home. I haven’t been in a while because it’s not so convenient to get all the way out to the country all the time, but today just happened to work out quite well. things are quiet here; the air is a little colder—we thought we saw a few snowflakes falling—and it seems a little cleaner. 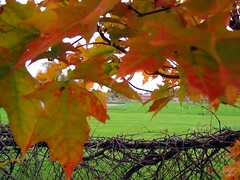 the leaves are covering the lawn right now in a thick, bright carpet of many colours. I spent part of the afternoon cutting up pumpkins for freezing, eventually to go into pies later on in the winter. I’ve noticed that my life has been lacking artistry lately—beauty surrounds me on all sides and I feel like the natural impulse is to sing in praise of God’s creation, but my voice has been weak—my pen longs to write, but the inkwell seems to have gone dry. I’ve been pushing my own limits in many ways of late, and that uses up a lot of free energy. I guess I’ve been feeling stressed out. Man needs to praise God, not only for his own sanity, but for the simple fact that God must be praised—part of our eternal covenant with God is that we, His creation, must strive to know Him and worship Him; and what higher form of worship is the expression of His name, the Creator? I want to sing, to paint, to write, to draw, to create. create art, create relationships, create beauty in this all-too-ugly world. read this and comment back with your feelings. This entry was posted in baha'i blog, journal and tagged family, reflections, weather by danger. Bookmark the permalink. I totally agree – I can feel the need to create welling up inside me. It’s a hunger, no doubt. Work and life just suppress it – they don’t fulfill it. When the quiet moments arrive, the hunger returns. I just wish I could make more of them. I know the feeling, Dan. Sometimes I long to create something, but then I feel too tired, or other areas of life and work are pressing. Actually, I think these are just excuses to avoid the pain of creating – the pain of discovering that your creative output is not adequate to the vision you had in your mind and heart, the pain of effort that creation requires, the pain of setting pen to paper, fingers to keyboard, brush to canvas, and actually cranking out your work. What has been the ultimate stress-reliever has been the use a wide mix of recorded music between our prayers at the weekly devotionl meeting in our home. There is nothing like good songs to put things right. Hey, good find on the U of Toronto website! When I miss creating something it feels like missing a part of your body. You just feel bad and don’t know why. Than I remember why, spend time creating something (in fact doesn’t matter how much time do I spend) and instantly feel reborn.